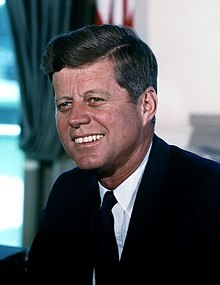 John Fitzgerald Kennedy tabi JFK (John F. Kennedy) (May 29, 1917 – November 22, 1963) je Aare ikarundinlogoji orile-ede Amerika. "Ask not what you can do for your country; ask what your country can do for you." Àtunṣe ojúewé yi gbẹ̀yìn wáyé ni ọjọ́ 20 Oṣù Kẹta 2018, ni ago 06:07.